Online stock trading has finally come alive through the pioneering of artificial intelligence and is now anybody’s game. This kind of financial technology has come a long way since the birth of direct-access trading in the ‘90s, which was the first time traders could interact with market makers and specialists to bypass actual stockbrokers. In fact, investors today have endless amounts of streaming information about an otherwise mutable market to sift through—so they seek a measured strategy and keen direction for the best odds to maximize their dollar. Trade Ideas is the kind of company that’s breaking down the “walls” of Wall Street. They offer real-time market planning and maneuvering, via stock scanning tools and virtually-harnessed artificial intelligence, to discover exceptional trade prospects for individual investors. Their software platform takes the stakes to a heightened level for not only direct access traders, but online brokers, hedge funds and institutions alike. RewardExpert had the privilege of talking with Trade Ideas CEO and founder, Dan Mirkin, on the many financial and technological feats the company has experienced since its inception in 2002. Holly is a virtual artificial intelligence analyst, or a robo-advisor that contains investment algorithms. Overnight, the AI engine (equipped with a million plus stock scenarios) scours the market for that day of trading and manipulates its findings to offer tested long and short opportunities. In other words, it offers advice on how to “beat the market.” Holly only delivers the strategies with a success rate of over 60 percent and a 2:1 Profit Factor on the next business day — making it more human than humans, when it comes to investment management. Holly also helps investors discover exclusive companies that aren’t in the mainstream trade, so rather than chasing the trite corporate stocks of Amazon, Apple, Telsa and Netflix, etc., Trade Ideas introduces its users to more savvy and hidden gems. The pricing structure for Trade Ideas is nominal and to the point. It starts with a Standard Plan of $118 per month, which includes: a flux of trading ideas, 10 simultaneous charts (with a visual assistant for these only), 10 price alert limit, plus a channel bar for curated workspaces and a live trading room — hosted by expert Barrie Einarson. But, if you’re ready to get serious about your trading, for a mere $228 per month, the Premium options boasts 20 charts, up to 500 alerts, risk assessment and stock scanning tools, and, of course, Holly for all your stock advisement needs. To save their dogged and determined subscribers more money, Trade Ideas offers yearly pricing, as well. The monthly cost of the Standard Plan breaks down to $3.90 a day and the Premium at $7.50 a day, but, if you opt for the annual billing, Standard lowers to $2.90 a day and the Premium to just $6.20. At the end of the an exchange day, that’s a small price to pay for stakeholder success. Trade Ideas ingenuity has no ceiling and is in a continuum of innovative motion. They specialize in “Idea Generation Technology” that is taking real-time decision support, strategy and system navigation to a higher plane in overall understanding of trade equity and the shifting marketplace, as a whole. 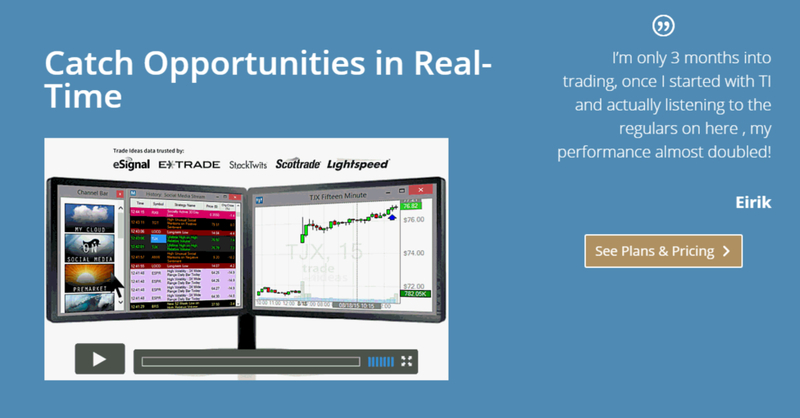 Whether you’re green or a pro trader, check out how Trade Ideas can elevate your market approach at www.trade-ideas.com.